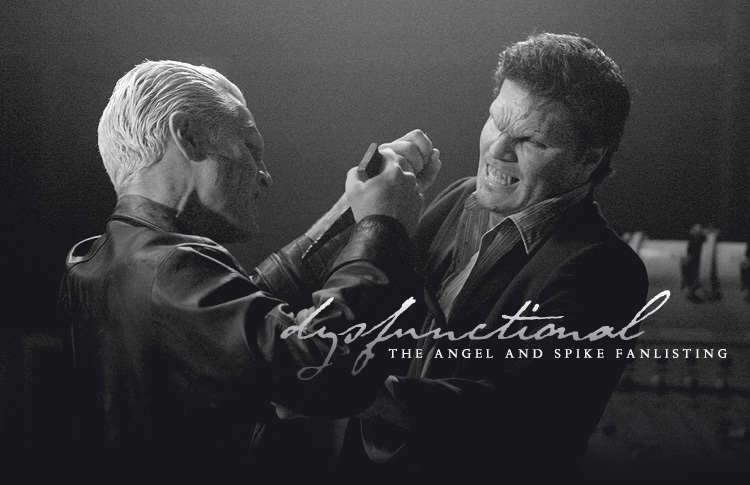 You've reached the only fanlisting approved by The Fanlistings Network for the relationship between Angel and Spike from the TV series Buffy the Vampire Slayer and Angel. A fanlisting is just what the name suggests: a list of fans of a particular subject. It can be about virtually anything: a celebrity, a movie or a TV show. If you're a fan of Angel and Spike's relationship, you can join the fanlisting to show it. This fanlisting was opened on September 30, 2011 and last updated on April 1, 2019. It currently has 802 members, with 0 waiting to be added. This fanlisting is not officially affiliated with 20th Century Fox or Mutant Enemy Productions in any way. No profit is made from this site and no copyright infringement is intended. Dysfunctional is run by Erika and is part of Perfectly-Cromulent.net. This fanlisting was previously owned by Holly, who kindly passed it on to me.